At an unprecedented pace, cloud computing has simultaneously transformed business and government, and created new security challenges. The development of the cloud service model delivers business-supporting technology more efficiently than ever before. The shift from traditional client/server to service-based models is transforming the way technology departments think about, designing, and delivering computing technology and applications. However, the improved value offered by cloud computing advances have also created new security vulnerabilities, including security issues whose full impacts are still emerging. 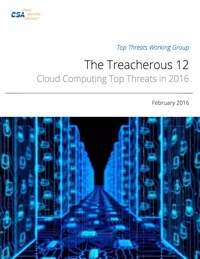 The 2016 Top Threats release mirrors the shifting ramifications of poor cloud computing decisions up through the managerial ranks, instead of being an IT issue it is now a boardroom issue. The reasons may lie with the maturation of cloud, but more importantly, higher strategic decisions by executives in cloud adoption. The 2013 edition highlighted developers and IT departments rolling out their own self-service Shadow IT projects, and the bypassing of organizational security requirements. In 2016, cloud adoption may be effectively aligned with the executive strategies to maximize shareholder value. The always-on nature of Cloud Computing impacts factors that may skew external perceptions and in turn company valuations. Wider reaching architecture/design factors of Identity, Credential and Access Management, Insecure APIs and System & Application Vulnerabilities rise in the survey, while data loss and individual account hijacking fell in comparison. Scott is an architect that manages the Microsoft Azure security organization, with recent previous responsibility including Azure Compliance. His primary responsibility includes ensuring that Azure is the most secure cloud platform in existence, and that the features used to secure Azure are also made available to customers. He has been involved with security at Microsoft for over 20 years, with contributions to Windows, Security Products, and Online services. He has held positions including support of Microsoft developer customers, software development, system and security architecture, and management of development, test, and program management teams. Dave currently serves on the board of directors at the SANS Technology Institute and helps lead the Atlanta chapter of the Cloud Security Alliance. Please contact Top Threats Working Group Leadership for more information. Want to contribute to the Top Threats Working Group? Which Top Threats Working Group initiative are you most interested in? Your request to join Top Threats has been recorded. Someone will be in touch with you soon with more instructions.